If you’re interested in the whys and wherefores of the reasons Christians are not required to keep the law of the tithe, there are a number of great articles out there to help you understand. Check out this one and this one for starters. Second, the words “tithing” and “giving” are not synonymous. The New Testament is rife with admonitions to Christians to give, and examples of Christians giving (many of which went far beyond the amount that would have been required by tithing laws) to meet the needs of the church. 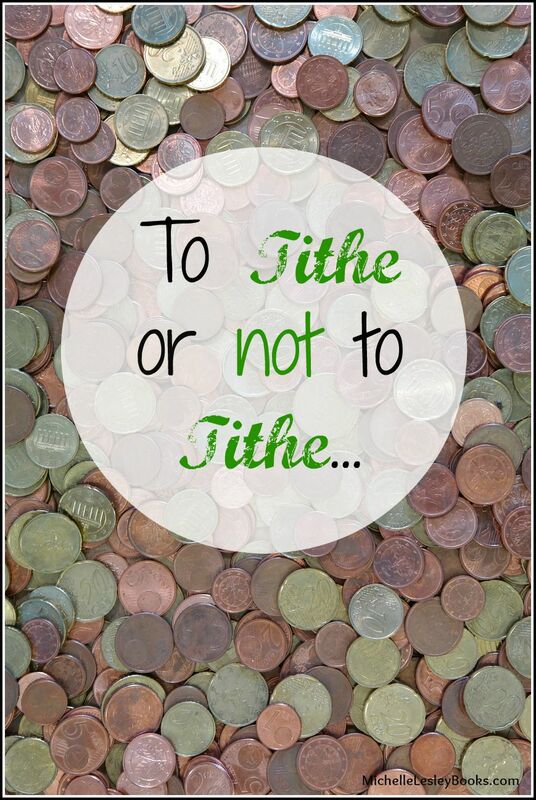 So, tithing- no. Giving- yes. But there’s another aspect of this question, a bigger picture, that doesn’t fit neatly into a “yes or no” category. It’s the heart of the matter. The matter of our hearts. There are those who will read the articles I’ve linked to above, and, despite solid biblical teaching on why Christians are not required to keep the law of the tithe, will balk at the idea. I know this because that’s exactly what I did when I was first introduced to this teaching. 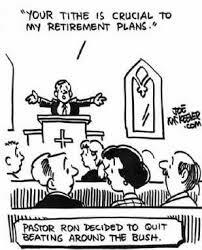 Most of the churches I’ve attended have taught that tithing is a requirement for Christians. It wasn’t a question of “should we or shouldn’t we,” it was the parsing of “gross or net”. 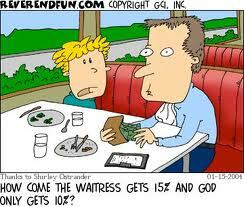 Tithing was just assumed. And when you hear something that goes against what you’ve been taught in church all your life, you just naturally resist it. (As well you should. Many of the “new teachings” and “fresh approaches” you’ll encounter out there are nothing but centuries old heresies with a shiny new coat of paint on them.) But sometimes somthing we’ve been taught in church all our lives is wrong. Once you put your Berean spectacles on and thoroughly examine the Scriptures, do you still bristle at the idea of throwing out the requirement to tithe? Why? Because it’s easier to write a check on autopilot than to take the time to examine our hearts. Raise your hand if you remember offering envelopes in Sunday School. When I was a little girl, we filled out an offering envelope every Sunday in Sunday School whether we were giving an offering or not. There were little check boxes on the front of the envelope that said things like “Bible brought,” “Attending worship,” “Bible read daily,” etc. It was the way the teachers counted attendance and organized statistics. As fallen creatures, we are bent towards keeping one of those offering envelopes in the back of our minds. “Read my Bible today.” Check. “Prayed.” Check. “Wrote out my tithe check.” Check. And our spiritual lives never go deeper than a check on a checklist. Remind you of anybody? The Pharisees, perhaps? Ouch. Time and again, Jesus told them that their relationship with God wasn’t about surface behaviors, but a heart to heart –my heart to God’s heart—communion and intimacy with their Creator and Redeemer. And I don’t know about you, but my fallen, broken, old nature resists that like the devil. Why? Because it’s messy and dirty. There’s no clear cut, singular, magic “right answer”. It requires a lot of time and effort and trial and error. It can get frustrating and discouraging. It’s inefficient. It’s so much easier to just check off a few boxes, be done with it, and be on my way. But that bent of our hearts is exactly the opposite of what God wants. He doesn’t want to receive our remuneration; He wants to consume our hearts. “You have heard it said…” Jesus said to the Pharisees, quoting the law, “but I say to you…” it goes much deeper than that. It’s not enough to keep from murdering somebody. What are the selfish motives in your heart that made you angry with your brother in the first place? It’s not enough to refrain from the act of adultery. What’s going on in your heart that you’re even looking at that woman? It’s not enough just to dutifully fulfill the requirement of the law. I want you to have a heart that is so dead to self and alive to Christ that it goes the extra mile joyfully. Woe to you, scribes and Pharisees, hypocrites! For you tithe mint and dill and cumin, and have neglected the weightier matters of the law: justice and mercy and faithfulness. These you ought to have done, without neglecting the others. You blind guides, straining out a gnat and swallowing a camel! How’s that cup and plate looking? What’s going on in our hearts that we’re not already –simply as a result of being a new creature in Christ—giving of what we have whenever we see a need? It didn’t occur to the early church to quibble over percentages and gross vs. net. Their brothers and sisters were in need, and they dipped into the coffers of the treasure of their hearts –their love for Christ and the brethren—and met those needs. Maybe we’re just not as acutely aware of the need today. Well get aware, and rejoice in your opportunity to give! Your pastor and your worship leader and, depending on the dynamics and circumstances of your church, other church staff members, need to be able to support their families above the poverty level. There are people in your church who have lost their jobs, and despite their best efforts, haven’t been able to find new ones. They need your help. There are pregnant teenagers all over your city who don’t want to abort their babies but don’t see any other options. What can your offering do to help them? There are people groups all over the globe who have never seen a Bible or heard the name of Jesus. How can we best steward our money to get the gospel to them? People are dying and spending eternity in hell. Starving to death. Being abused. Living on the streets. Risking their lives to get their hands on a Bible. Trying to put food on the table as they labor to bring you God’s word. The check you put in the offering plate every Sunday can help them.